One of our promises is that our tools – our Grids package – helps you to make games fast. We have designed it keeping in mind the things you will need when making a game. We played hundreds of games that use grids, analysed their mechanics, and worked out a uniform structure to make it easy to solve the type of programming problems you are likely to meet. We know games go through lots of iterations; we want to remove the tricky bits standing in the way. But is this rapid development an empty promise? To prove that it’s not, we made 30 small prototype games for Unity during the month of November 2013– one game a day. After porting Grids, we want to prove this promise for GameMaker too. 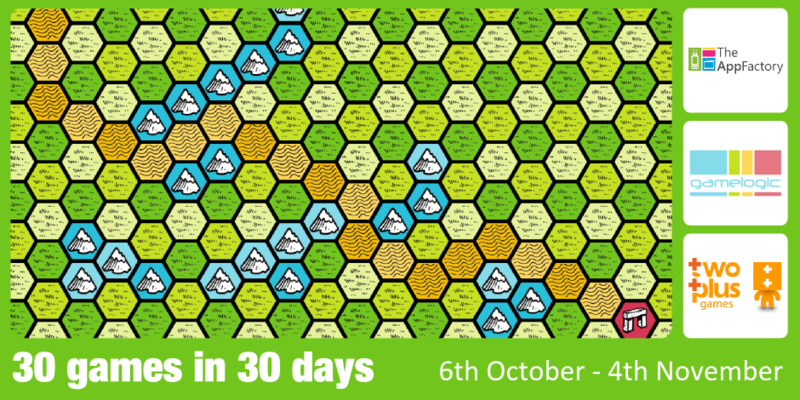 So this month we’re making 30 games in 30 days using Grids for GameMaker. We’ve teamed up with the Microsoft AppFactory and Twoplus Games who will be making the games with us. We’ve got a big team of developers, all with different levels of skill and experience. So Grids will be put to the test, both for how fast you can make games but also for how easy it is. We expect a whole range of games during the project and are excited to see what each developer can come up with. Again the games will be small and simple, but they will be able to be won or lost and we hope to take some of them further after the project. We will put each game on this page for you to play and we’ll write about them on our blog. Finally, we’ll be porting each game to Windows Phone 8 and we’ll announce their release in the store as soon as it happens. Game 1 is a version of the game Solitaire (or solo Noble), played on 13 different boards using a rect grid. Game 2 is a version of the game flow played on a hex grid. 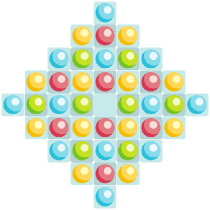 The aim is connect each set of coloured dots by clicking on cells to create a path between them. Game 3 is called Laser Bomb and is played on a rect grid. The aim of the game is to fill more of the board than the AI by strategically placing laser bombs. Game 4 is a version of the classic game Lights Out, with a couple of twists, including 3 cell states and neighbors with edges. We call it Power Out! 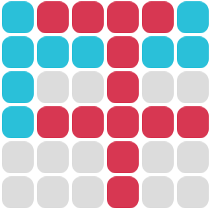 Game 6 is a simple match game on a rect grid. You click on creatures to rotate their neighbors, and match creatures in a 2×2 square. Game 7 is the first game to use a wrapped grid! Get your ship to Castle White and avoid the cannon balls shot by Castle Black. Game 8, or Temple Escape, is a maze like game where the walls of the temple change with every move, and your way out is hidden until you get close to it. And oh yes, rooms are going up in flames! Game 9 is Bug Wars! Survive an attack from the evil bugs while trying to collect powerups to increase your chances of survival. Watch out for the powerdowns, they will surely be your doom! Game 10 is a simple memory game on a rect grid. Find the cheeses or die trying! Game 11 is called Add Down. It’s a matching game where you add blocks of numbers together. To clear numbers you need to (horizonatally or vertically) mimic a 3 digit number above the grid. Game 12, or Fruit Harvest has a simple goal: harvest the fruit before they hit the ground. Look out for golden fruit and watch out for rotten fruit! Game 13 begun as a desire to use Conway’s Game of Life in an interesting way. And so, Convader was born. Game 14 is a racing game where instead of controlling your car, you control the environment. Create a safe path for your rally driver! Game 15, or Cave Lander, requires you to fly a spaceship through a cave, refuelling on the way and trying not to critically damage your armor. Game 16, or Purple, is a sliding puzzle game where the aim is to get down to one purple tile, by blending blue, red and purple tiles. Game 17, or Tetrifender, is an action puzzle game using tetrominos! Tower defence meets Tetris in a game where you must protect your fort and sink your enemies! Game 18, or Flipex, is a version of the game Fault, played on a Hex grid. How many matches can you make before getting trapped? Game 19, or Triangles, is a puzzle game on a hex grid where the name says it all; make more triangles than the AI! 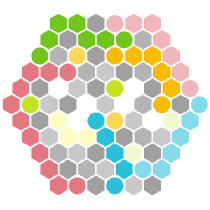 Game 20, Hexavity, is an match-game where you control the direction of gravity. How many cells can you remove? 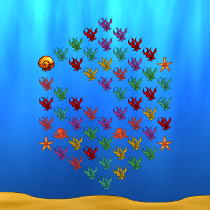 In this game, Pixel Perfect, you have to add blocks and match arbitrary shapes to clear them. In this simple game, you have to try to make the longest possible path by repeating a given pattern. 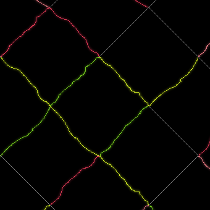 Game 23 is a matching game where cells continuously die around you. The aim is to match them before they do. In Bee Zapper you have to zap all the bees and none of the ladybirds. In Temple Escape 2 you need to find a path from show to key by rotating the triangles. Get to the goal before hitting a wall. Change your vertical direction with <SPACE>, and your horizontal direction with <CTRL>. Collect all the jewels for extra score. In Connect you need to connect the top-left with the bottom right..
On this game, you have to make all the cells blue by toggling rows and sectors. Game 29 is a spin on a Rubik’s Cube, but played on a 2D square. We call is Rubik’s Quared. Game 30, or Hex Raid, is played on a hex grid with clever tile design to simulate isometric art. Collect the coins and shift the cubes!